Details on the new DS3 and DS3 Cabrio have been released by Citroën, with the newly styled range set to be released in February. After its release in 2010, 390,000 DS3's have been sold, with a large amount of those sold in the United Kingdom. Most of the changes are on the outside, as the bodywork we're used to has been given a facelift, with a smaller grille and new front lights. Citroën has added new personalisation features to their extensive range, such as new colours and patterns for their Cabrio roofs, making the DS3 more customisable than before. The new PureTech 110 and 130 three-cylinder petrol engines have been teamed with both automatic and manual gearboxes, which Citroën say can achieve over 60mpg and 105 g/km CO2, one of the best in the hatchback field. New Performance models have also been added as well that have a 1.6L THP S&S engine producing 208bhp with the help of a six-speed manual, Brembo brakes, sportier bodywork and leather bucket seats. New features have been added to the cabin as well, including Mirror Screen functionality so both Apple and Android phones can be connected, a new 7-inch touchscreen and a sleeker interior with fewer buttons. 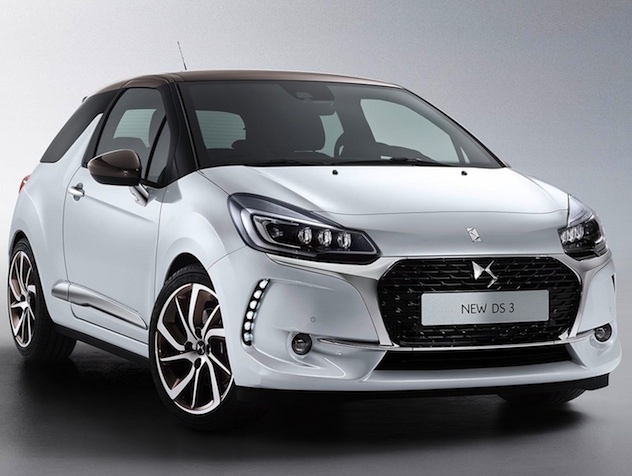 The DS3 has been popular since the release in 2010, due to its sleek design and affordability and more details on pricing and additional extras will be released closer to the release in February.